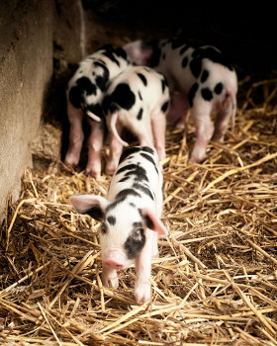 Welcome to Spinney Abbey Farm at Wicken, near Ely, home to the Fuller family since 1892. 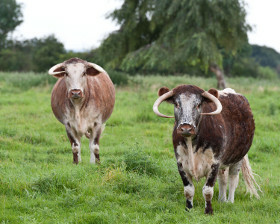 Our farm reared meat comes from traditional slow growing breeds, grass fed English Longhorn cattle and free range Gloucester Old Spots Pigs. 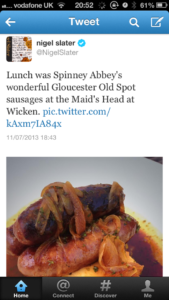 Our top quality pork, beef, lamb and venison are retailed at similar prices to those charged at most butchers. Monk & Disorderly Cider has won Best Cider and Perry at Norwich Beer Festival for 2018. The 4th time in 6 years! Monk & Disorderly is now available in 500ml bottles for £2.95. Free Range Eggs are available £1.50 for 6 from our chickens, including White Leghorns, Copper Marans and Legbars. We are currently planting Borage seed to help out our bees this year. Markets this year: We will be attending the Farmers’ Market at Burwell. Monk & Disorderly has won Best Cider at Norwich Beer Festival 2013, 2015, 2016 & 2018 and St. Neots 2016. See our Cider page for a full list of where you can obtain a pint or two. For 2019 all of our heifer calves will have names starting with the letter L. If you would like to suggest a name please feel free to get in touch on our Facebook page! So far we have Lynne, Lucy & Lynda. Our shop is open at the farm every Saturday morning from 9-12, to come outside these times ring Jonny on 07803 132561, there is normally someone about! Burwell Farmers’ Market – We will be there on the second Saturday of every month, 9-12pm at the Village College selling our meat and In Littleport on the first Saturday of every month. If you would like to order anything for collection from the Farmers’ market please call 07803 132561 by the preceeding Wednesday at the latest. See our page on Facebook for up to date news and photos. We sell a wide range of cuts of Spinney Abbey beef, pork, venison and lamb. For the current price list, please click here. If the specific cut you require is not listed, please contact us as we can cut to order. Meat can be collected from the farm or we can deliver locally. In 2012 we opened our new Cutting Room and all of our meat is now butchered on site. 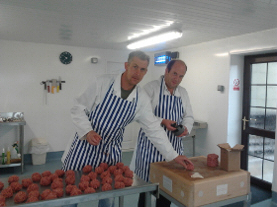 Pictured above are Jonny Fuller of Spinney Abbey, and Jonny Watkins making our premium quality beef burgers.